As we follow the life of Jesus we see that He accepted and loved people regardless of their circumstances or life choices. He loved children and accepted women as equals in opposition to cultural norms. We see that He healed the sick, delivered the demon possessed and encouraged the discouraged. He is called the Lamb of God. A lamb is not a very aggressive picture! The only people He opposed were those who used and abused others. Is this a Person to be afraid of? 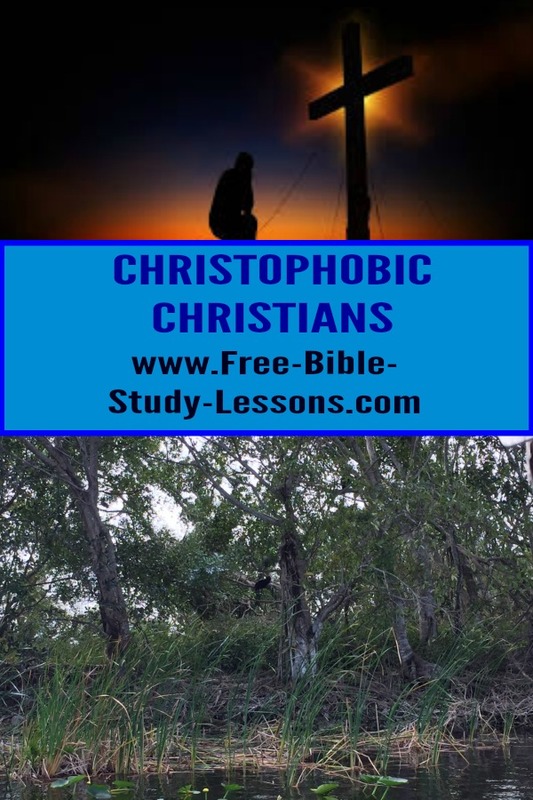 Why are some people Christophobic? Let examine how some Christians are actually Christophobic. Many Christians have a fear that if they give their lives totally to God He is going to make them do something they do not want to do. For example, a Christian who loves living in the city may think, “If I yield my life totally to Christ He is going to send me to some primitive, isolated mission field where I will be eating ants and drinking muddy water […and no Starbucks for 1,000 miles]. While this may sound foolish, many of you know exactly what I am talking about to one degree or another. This is a lie from the devil on several fronts. 1. Christ came to set us free. Before we came to Christ we were slaves of sin. We had choices in the style of sin we engaged in, we had no real choice to be free from sin. Before the Fall, Adam and Eve had a real choice - they could obey God or not. In Christ we have been liberated. That means that we have a real choice. No Christian is forced to sin, it is always a choice. True, sometimes we are so enwrapped in the lies of the devil that we feel like there is no choice; however, that in itself is a lie. We need to learn our identity in Christ and walk in it. Dr. Jonathan Welton [Eyes Of Honor] and Neil Anderson both have great books on this subject. In saying the above, I am not saying that I believe we will ever have the experience of being totally free from making sinful choices. Our position in Christ is sin-free and nothing we do will ever change that. Our daily walk on this earth is one of exposing the lies we have believed and overcoming them to the glory of God, but it is a life-long process. Only the Holy Spirit through the Word of God can expose the lies we have believed and led us into walking in the Truth. This is not a road of condemnation - that is another lie of the devil - but a guilt-free repenting of sins and walking in Truth. The Holy Spirit doesn’t reveal all the lies we believe at once or we would be overwhelmed. As I said, it is a process and He step-by-step moves us toward the position we already have in Christ. 2. So, with that in mind, will God require Mr. or Miss Christian who loves city life to dump it all and get lost in the jungle [or vice versa]? God does have a plan for each life, that is true. However, when God set us free, He really set us free. He is not the God of slaves. He is the King over kings and Lord over lords. God never forces us to do His will. We will always have a choice to obey or not to obey. In Christ, God has restored free will to us. How will we use it? However unlikely, God may asked Mr. or Miss City-Lover to sacrifice their desires and preferences for the benefit of the Kingdom of God, but He will never force them to do it. And, He will not stop loving them if they decided against His plan for their lives. We have to realize that God’s love for us is not conditional upon our works. I remember hearing Gladys Aylward tell of when she was in China and praying for God to send over a man to be her husband and co-worker. She felt God answered her prayer. But no one ever came. Someone was called, but refused the call. The mysterious “he” missed a rewarding destiny likely out of fear. I also heard a pastor, who started a new work in a new community, say that God revealed to him that he was the 5th person God had asked to do that work. The others had ignored or refused. Do we really want to miss out on God’s best by saying “no” out of fear? 3. God designed us so that we would be fulfilled doing His will. We may think one thing is fulfilling but God knows we would be better fulfilled doing something else - something that right now we may be fearful of and never imagine that we would enjoy. Keep in mind that God designed you and gave you the personality and desires you have on purpose. His will is going to bring you to the best you can be and fulfill your destiny. We may think we know what is best for us, but God really knows. Will we trust His judgment or our own? 4. God is good. As Christians we all believe this. But when we act Christophobic it is because a little seed of doubt has been planted by the devil and we have allowed it to grow. Is God really good? Can I really trust Him with my life, my family, my future? Those little Christophobic thoughts are really life-limiting fears that will hold us back. We need to face them head on. Our confession must be: God Is Good and Jesus Is Lord. We must take hold of it by faith. Our sight, senses and thoughts may be screaming, “You’ll be in trouble if you trust God completely. Make sure you have a back door. Don’t burn all your bridges. Reserve the right to make a final judgment on your action for yourself. Don’t mindlessly follow God. You don’t know where it will lead!“ If we really believe that God is good then we know that even if we go through the valley of the shadow of death there will be green pastures and still waters on the other side. 5. Sometimes Christophobia fears what Christ will allow into our lives or that getting too close to Christ will paint a target on our back for the devil. Will God allow bad things to happen to me? The answer to that is largely a matter of perspective. From a human point-of-view bad and even horrific things may happen. But from God’s perspective He only allows into our lives what is for the good of the Kingdom of God, our ultimate benefit and a reward that will far out weigh what happened. It comes down to our trust and love of God. Love drives out all fears. The safest place in the universe is in the arms of Jesus doing His will. Many of us are like a fearful, hesitant young lady sitting on the side lines at a fancy ball. [I know us guys will have to use our imagination, but even we have to get used to the picture of being the bride of Christ.] You wistfully watch others dancing. Then before you, looking into your eyes, is Jesus. He holds out a welcoming hand to pull you onto the dance floor of life. His eyes of love are on you as He invites you to dance with Him to song He has written specially for you…and song that will never end. Will you reach up and take His hand and feel His embrace or will you allow fear to hold you back?